This past August, right before the Labor Day weekend, a new gated neighborhood in Springfield welcomed its first residents. The latest housing subdivision was the first of its kind in Springfield — it was designed specifically for homeless people. Eden Village is a planned community of tiny homes for chronically homeless people. The village features a community center and 31 400-square-foot homes with a bedroom, bathroom and kitchen. These homes were purchased and furnished by organizations, businesses and individuals throughout Springfield. Two banks in the area, Great Southern Bank and Central Bank of the Ozarks, each bought houses that are now homes to individuals who had no place to call their own. The work of these banks with Eden Village illustrates how our commitments to our communities extend beyond our banks’ doors. Throughout Missouri, you’ll discover every bank is deeply connected to the communities they serve. From the rural banks on the town squares to the metro banks in the downtown, each bank is the heart of your community. As we gather with our family and friends to celebrate Thanksgiving, I am reminded of the work that our bankers give to their communities. The following are just a few examples showing the time and resources that bankers dedicate. In classrooms across the state, students are learning about savings, taxes, insurance, debt and budgets in course materials purchased by their local banks. These same banks financially support the schools’ extracurricular activities that provide students with an opportunity to enhance their talents. In some communities, banks offer resources to assist students in families with limited means. The U.S. flags flying outside our buildings remind us of our country and the sacrifice of the men and women serving in our military. Supporting programs like Segs4Vets, the Honor Flight Network and ceremonies honoring local veterans gives us the opportunity to thank these men and women for protecting our freedom. There are families and individuals who struggle to have basic needs — food, shelter, clothing. This Thanksgiving, many bankers will volunteer to prepare meals and serve food for the homeless. Banks host clothing drives for coats, hats and gloves for those needing these winter necessities, and some donate resources to utility companies and electric co-ops so these families have heat this winter. During their holiday shopping, some bankers purchase gifts for children and families they don’t know — they just know that no child should wake up without a gift under the tree on Christmas morning. Walks held throughout the state support research to find cures for cancer, heart disease and Alzheimer’s, among others. At these walks, teams of bankers are raising funds and awareness for these various causes. Personal benefits are held to aid families with increased medical costs because of recent diagnosis or unexpected accidents. to serve on fundraising campaign drives for these projects. I know I didn’t capture all the ways banks support their communities, but this just gives a quick glance in how banks make a difference. And, bankers make a difference in their co-workers’ lives, too. Just consider the number of bankers who extend their support to colleagues. A banker with extra sick leave donates time for a peer caring for a sick loved one. Another banker performs this individual’s tasks so attention can be given to family members. Bankers lend a helping hand to a colleague completing a major project. An individual offers a kind word to someone who is struggling. A banker takes time to mentor a new employee, offering guidance when needed. Although these acts are simple, they may mean the world to the person receiving these gestures. The same can be said for our volunteer work and support given to our communities. Our actions show our commitment to our communities and the people who live there. It shows that we believe in a cause, that we believe in those we are helping and that we believe in something bigger than ourselves. This Thanksgiving, I am thankful to be surrounded by those who feel the same way and are doing their part to help their communities. To each of you serving your communities, thank you. 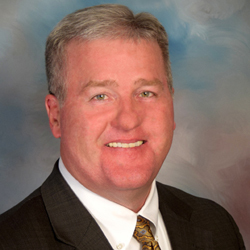 Shaun Burke is president and CEO of Guaranty Bank in Springfield. Burke has led Guaranty Bank since 2004 and has more than 30 years of banking experience. He has served on the MBA Board of Directors since 2012 and has chaired the MBA’s Legislative Affairs Committee and the Budget and Audit Committee.